Since the disastrous events of 9/11, security both specific and general has tightened up. In Britain, a country which has long prided itself on the lack of a written constitution (possibly confusing that with a fortitude in the health department), this same attitude gives rise to having police without weapons and having no need of individual identification. 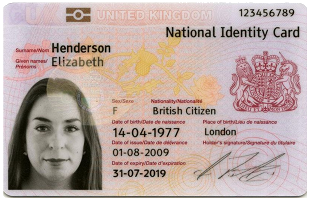 However, the general public and the state reaction to the incidence of terror attacks generated a perceived need for ID cards, a contraction I like as the Latin ‘id’ means ‘of itself’. Yet we do not have them. I wrote an email to the Home Office early in the process of discussion, asking if I might participate in any trials of such documents; there came no useful reply and no testing has, to my knowledge, taken place. There has been much discussion in the so-called people’s forums, in the press and in Parliament, but we do not have an identity card still. There are arguments for and against, on which I will not dwell here, largely because I find the idea so obvious I cannot defend against it with other than the nihilistic and overly conservative “we don’t do that”. In my last few months in the UK I have been required to fill in many forms declaring name and address. One does this a lot when moving house but more so when changing country. There is an element of hypocrisy in this process, for the address the departing person gives is soon to be defunct. Thus I have been asked today, as part of filling in a request to have my mail redirected, to prove that I am me and to prove that the address to which my mail has been going is where I live. I find both ideas confusing. I am standing in front of the official – do I not exist? Is it that my declared name may not be true? Is it that I am maybe not the true owner of the name? How then does ownership of a document prove this? One’s driving licence or one’s passport suffices magically (but the official does not scrutinise the photograph). We do not all possess these. Similarly a credit card is apparently acceptable proof that you are who you say you are, yet that has no photograph. More ridiculous still is the proof of address. You are to produce any of: two utility bills, a driving licence (again), a bank statement, a rent book. Yet I live in accommodation given as part of the job, so I pay no rent, pay no bills and even my mail goes not to where I actually live. I had a repetition of this in trying to move my bank account. This time, despite having been a customer for 30 years, I am required to prove who I am (and all the bank’s own accreditation is deemed worthless) and where I live (again, two utility bills) but not, I repeat, by showing a bank statement. So who else would have been receiving my statements, pray? The bank manager saw the silly side of this but also pointed out the extensive legislation demanding that proof positive be achieved. Why is it so essential to have a residence? We live in an age where the electronic transfer is king; given sufficient security we could be working from anywhere. Consider, however briefly, the location of our telephonic support services, those welcoming crystal Scots voices, the occasionally pellucid Indian voice, the mangled Asian, the uncultured Brit and the completely incomprehensible American, the last two of which I suffered today. They do not need to be in the UK to provide the service. I used email support for my Suunto watch, to find that this written electronic support came from Sweden, Finland and from Newfoundland. I needed to know even less from the written word, and enjoyed the whole experience, particularly in comparison to using the much-hated phone [#30]. So why is an address necessary when snail mail is steadily disappearing under a welter of unwanted drivel? Is it to check up on us? Is it in lieu of an ID card? What, quite, is the purpose? To some extent this is a response to the perception that we must increase our security. But, one asks, to what end? How does establishing that I have an address that others recognise as valid make me an acceptable body with whom to do business? How many Heads of State are in the same position as myself? They too often have no rent, no bills and a remote mail point. Does evidence that I might be using a valid name prove that the body talking has this name? No it does not. The paperwork might match up, but the evidence does not. When did you last see someone actually read a signature, or test that is the same as the one on the card you just handed over? It must be so very easy to steal an identity, to steal the right to wave (but not waive the right) a card, as it is to clone a car number plate. I was much amused that the bank manager was all excited at my production of the proof of transfer of my car number plate – this was proof that I exist, from no less than the proper organs of the government. So, apparently, proof of inherent mobility constitutes concrete proof of permanence, of stasis and of status. I cannot get my head around that. Just this morning I have had a failed delivery (the postman went to the one currently unoccupied door of the terrace) and I must collect it from the depot, several miles away – which of itself assumes several sorts of transport facility. One needs to take “evidence of your identity such as a passport or bank card”. Yeah, right: what’s in the package but my passport? And the very next such package I collect, as it happens, will be a bank card. Yet it makes sense that, to collect such a vital document, one should be able to verify identity. I would have been better off with agreeing to collect from the depot in the first place – it probably would have saved a day’s worth of post. None of which escapes the critical matter: Is it the possession of a proof of identity that matters or is it that the identity you hold matches the holder? Is it that the individual must somehow be connected to a database and the identification serves to establish that connection? Why then is not, say, one’s National Insurance number sufficient? I have had post redirected to me this year from an insurance company who did exactly that; sent mail off to some government office requesting their mail be forwarded to wherever I am registered for Nat Ins. What a good idea; it presumably is one of the successful ways of reaching distant relatives post mortem for due deliverance of estate monies.